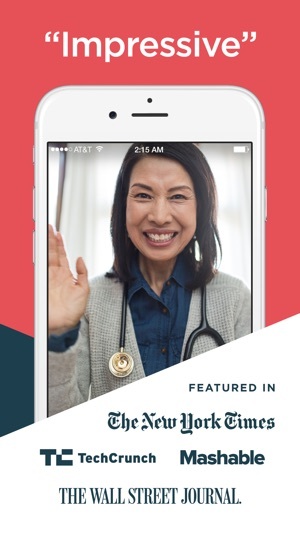 First Opinion is the fastest way to talk to a doctor, 24/7, at work or home, even at 3AM. Ask your doctor anything for free. Our top-rated doctors are by your side for the little question or the big concern. • FAST – Connect in minutes. 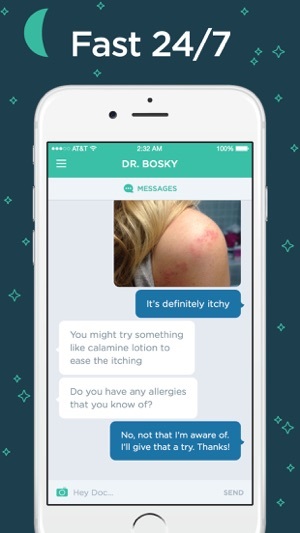 • FREE – Unlimited chat with a doctor, 24/7 for free. Ask a doctor any medical questions you have, right now. • NO TIME LIMITS – Stay connected until your issue is resolved. Message as much and as often as you’d like. • 100% PRIVATE – First names only within the app so you can share without any embarrassment. • COMMON MOM QUESTIONS – Ask a doctor, or pediatrician, about illness, nutrition, pregnancy, child development, fertility, sleep training, lactation, as well as anything else you've ever wondered about. Ask a doctor about care for your child or children. • GOING ON A TRIP? – Know what travel vaccinations you need and recommended prescriptions to carry. Plus you can take your doctor with you wherever you go. No need to look for a local doctor again. • SHARE HEALTH DATA – Automatically send your doctor info about your health and activity through HealthKit. • PERSONALIZED – Unlike a Google or WebMD search, your doctor gets to know you and gives health information specific to you. This app is useless. Yes the person (if they even were a doctor) gave me advice that could be a probable reason for what I asked about but I don’t even believe that these are doctors. I believe they are the same group of people answering questions that anyone can get off google. I wanted to get another opinion but you can’t talk to more than one doctor! Once you make an account you have to talk to the same person that they automatically assign you. So I made another account in hopes of getting someone else for another opinion. And when I asked the question, which honestly has the potential to be a serious matter which is why I want multiple opinions, they sent me a message saying that I will be blocked because it seems that I made a second account. Number one) how would you know it’s the same question just by using computers to find out if I word my question in a completely different way. And number 2) I have excruciating pain that I have been going through for months with no answers and I’ve gone through x rays, ultrasound sounds and I’ve finally gotten an mri so I am sorry if I want to get multiple doctors opinions and not just one online doctors opinion! Invaluable advice when it was needed most! I was able to get on and chat to Dr. Ruksana within minutes of signing on. She answered all the questions my sick and addled brain had, no matter how silly I thought they were. She made sure to ask not only about my symptoms, but my environment and activities as well, so she could offer advice based on a complete picture, not just a handful of symptoms! I can’t express how valuable that was! This doesn’t replace a doctor’s or hospital visit at all, but I would have been so much worse off if it hadn’t been for the advice of Dr. Ruksana. She advised me (based on my symptoms) not to wait and get checked out ASAP, and followed up with me later on. I am so glad I listened! I will definitely be continuing to use this app!!! I’ve had this app for I want to say months! And never deleted it from my phone. The doctor I’ve mostly spoken with is Dr. kheervani and she’s been a big help! I have many health problems and when I’m in a panic and in pain I can ask her questions and get responses really fast!! She will. Ask me questions and what my symptoms are surroundings, etc. and help me narrow down what it could be instead of my googling my symptoms. Now of course it doesn’t replace a doctors visit but especially when you can’t reach a doctor or you just want a first opinion ( hence the app name) you can consult with someone before going in to see a doctor. If you’re symptoms sound severe they’ll suggest seeing you’re primary doc ASAP or going to ER. © First Opinion Service, Inc.